Website planning can be an overwhelming task; so much is involved. You have to gather information and plan where you want that information to live. The design team comes in before the website is even developed, and all of this precedes testing, delivery, and maintenance on the site once it’s launched. This quick guide will walk you through the necessary aspects of a development strategy, including timelines involved in the overall process. 1. The development strategy should always align with the marketing plan. Begin with your visitor profile and demographics by interviewing typical users and creating a profile. What pieces of information are the average users looking for? Do they want contact information? Product information? Pricing? 2. If you already have a website, this next step involves reviewing analytics for a few different elements. You can use Google Analytics or other tools to measure top visited pages, time spent on pages, keywords searched on your website, and keywords that are getting visitors to the site. If you do not have a website, spend extra time researching keywords and ways to optimize your pages for the best possible user experience. 3. Develop or map content. Content is the text, images, documents, audio, videos, feeds, and anything else that lives on the pages in your website. Plan content based off of what your visitors are looking for, and off of your goals. Determine who will contribute and update content, and don’t forget to keep the keywords from step two in mind when creating it. How do you want to present your products or services? What call-to-action will be present on your homepage? Most importantly, does your website plan reflect your business goals? Is it set up for visitor growth, building a contact database, generating leads, sales? 5. Next, you need to find a development company. Take a look at a company’s portfolio to see what websites they’ve built, and determine if they are qualified to build the website you are envisioning. Communication between you and your chosen developer is important. Your developer should never have to make assumptions, and all information should be clearly communicated so that deadlines are met and the projects fall within the scope. Each step, however broad, plays a key role in website planning. Timelines will differ depending on the size of your website. 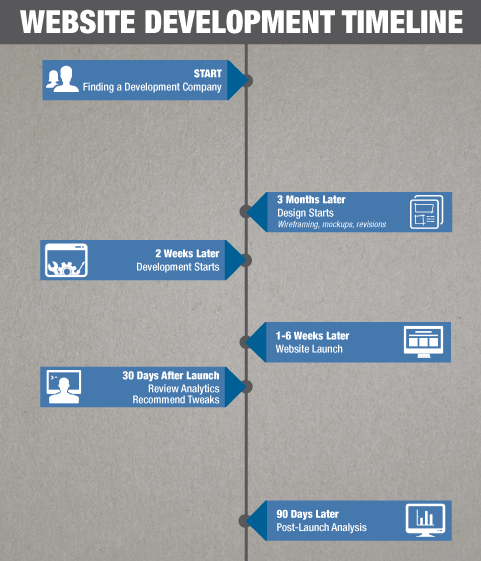 The image above depicts an average timeline for a small-business site. When planning your next website project, keep this beginner’s guide in mind. Base your development strategy off of your marketing plan. Website planning may not be easy, but the time spent will guarantee an efficient, user-friendly site that aligns company goals with website function.